Dessert Darling Wedding Dessert Table, Part 5: Cheesecake Pops by Sweet Lauren Cakes | Dessert Darling blog will quickly reveal the most darling Cake Pops that you have ever seen. These ladies are PROS who clearly care dearly about every fastidious detail of each delightful pop. Wow! I was so happy to find not only adorable Cake Pops in Northern California, but also a company that would make Cheesecake Pops, as these seemed rather impossible to track down. Lauren went so far as to create a new recipe so that my wildest wedding fantasies could come to true. I needed Cheesecake Pops, verses regular Cake Pops, because I didn’t want to have a treat that would be redundant with the Swizzle Cakes. Furthermore, the slightly salty, sour touch of the cheesecake would be a nice contrast to the other, simply sweet selections. At the end of the day, Sweet Lauren Cakes nailed it. 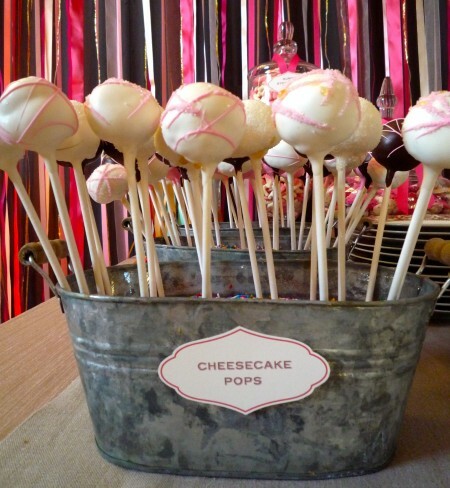 Cheesecake pops sound terrific. I hate regular cake pops because of al the icing.